Can India Find an Answer to a Question Called Obama? Ever since Barack Obama has won the American presidency many of us have been trying to concoct a story to fit in some Indian politician with (if possible, black color) and humble roots as the main protagonist. While looking for the possible candidate we don't forget to include the epithet 'The Indian Obama' before those names which according to us make the cut. In this quest to find an Indian Obama sometimes we even forget the real Obama and remember only the physical self of Barack Obama. We equate blackness of color to Indian Dalits (indubitably the most oppressed caste) most often forgetting every other caste and creed and we think his story of coming from nowhere can draw a parallel to any Mangat, Maya or Mulayam. Shall we be so eager to find an Indian Obama that we let our nous fall prey to the very predatory nature of Indian politics? Shall we be so na've to sacrifice a rational discussion about the leadership just in the quest of looking for our own 'Rubicon Moment'? 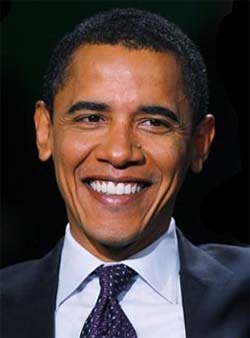 When we think of Mr. Barack Obama, the face of a young politician who has at his heart the cause of his nation, yes, his Nation, engenders before our eyes. We heard him umpteen number of times addressing his words to his 'fellow citizens'. We remember the sight of Barack Obama, a presidential nominee, expounding the key points of his policies to an ordinary American citizen, in utter earnest manner on one of his campaign travels. The fact that Mr. Obama continued his job of first a lecturer and then senior lecturer at University of Chicago Law School (to run his household along with his wife) throughout his state senate career from 1996 to 2004 speaks volumes of his character. His pledge to work in tandem with his election rival John McCain towards seeking solutions for domestic as well as foreign policy issues presents him as something more than just a leader. No doubt Mr. Obama comes from nowhere but did he ever represent himself as the leader of victims of obscurantism? That's why whenever we think of Mr. Obama and his skin color in the same breath we, may be though inadvertently, end up inflicting injustice on the accomplishments and acumen of Mr. Obama. Barack Obama is just Barack Obama and that is that. What has led him to Oval Office was a combination of factors we so rarely come across in a leader. His skin color makes his election historic but it was his Achilles' heel not advantage and it required him to be what he is not what he happens to be to win the election. Mr. Barack Obama would have emerged triumphant even more easily if he had been white facing either white or black candidate. His being black, global citizen or having middle class upbringing are just the facts which can come in handy while writing his biography but to understand Barack Obama, the leader, we need to know the man inside not the man outside. This politics of exploiting outside traits points to only one direction and reinforces only one point that we are so rooted in outside factors of a personality that inside factors which play much greater part in the formulation of a leader are left unrevealed. In India when we try to fit in somebody in the clothes of Mr. Obama we are trying to pack grapes and sometimes soar grapes into the plate made for freezing ice cream. Some people have cited the name of 'neck deep into corruption' and queen of politics of revenge Ms Mayawati as the Indian Obama. I wonder what feature of Ms Mayawati did these commentriates find in sync with Mr. Obama? Or the reason that she is a Dalit or she comes from nowhere is enough to draw this odious parallel? When was the last time when Ms Mayawati dared to bring the name India on her lips? When we heard her charting out the economic plan for her state? At the most she can be an inspiration for Dalits to come on top but that doesn't place her on the pedestal reserved for a statesman. She needs not only transformation in her politics but in her personal attitude also to be a national leader. And if Ms Mayawati can be Indian Obama then what stops Mr. Lalu Prasad Yadav to lay the claim or for that matter even Mr. Paswan to be Indian Obama. Some people adduced Mr. Rahul Gandhi to be the righteous claim holder of being Indian Obama. Rahul Gandhi may be a generous human being and decent leader as he has illustrated in recent times but he still is the favorite son of dynasty politics. He has to travel a long distance to come out of the shadow of dynasty politics and create his own space under the sun to be able to find an echo between him and Mr. Obama. The prospects of a Dalit leaping to be the Prime Minister may look glamorous for the blind champions of democracy but neither it can be realized nor can it be thought of so long as the present party system persists which is a symbol of conflict between the nature of parties and what they preach. The colossal gap of thinking between political parties and public often becomes the major cause of resentment between the two but this resentment remains passive only. Though what political parties feign public practices the rise of a leader from the subaltern trenches of society will not happen, if ever it happens, at the will of public but in the garb of vote-bank politics. Most Indians don't have any problem with either a Muslim or a Dalit being their President or Prime Minister so long as he is a great leader. When an overwhelming majority of Indians wanted Mr. Kalam to continue as President our political parties played spoilsport displaying utter irreverence to wishes of public. In a nation where party politics holds entire nation to ransom and poor public manifests ample signs of smug obsequiousness the prospects of a leader like Mr. Obama looks bleak. Our politics demands one to be not only strong willed but valorous and mighty also to be somewhat honest. If you want to be in the center of the game, as the politics is often deemed by major players (politicians), you will have to be the player otherwise either you will be pushed to the corner or even out of the ground. And to be the player you will have to be hand in glove with all others. When we talk of today's India we talk of a nation where the very idea of India which once produced great national leaders has lost its appeal among those who profess to be its patrons. Everyone represents their vote banks with different parts of country belonging to different parties and in this imbroglio no one knows who does India belong to? In this backdrop wouldn't the very idea of trying to find an Obama in current crop of politicians is a foolhardy thing in itself? During his 21 month long campaign never did once Mr. Obama said anything to risk the disintegration of United States of America and here we are not averse to make even festivals the tools to further our political ends. To be able to find an Indian Obama, regionalism and regional parties will have to go. Perhaps Mr. Obama was lucky to have been born in America for he did speak for unity and people responded in affirmation. He may have to face an audience short on confidence but certainly not an audience short on national awareness and consciousness. He may have to face an adversary not shying away from hurling personal diatribes but certainly not an adversary escaping a serious debate on issues of national importance. As strange as it may seem but still our politicians don't win over us as Mr. Obama did to his fellow citizens. Our politicians entice us by indulging in gobbledygook, intimidate us and if that is not enough packs us into trolleys and trucks on the poll day and buy a vote for a note of Rs. 500. The ignominious fact of education almost like an alien entity in many part of the country has not only to do with the huge population and lack of funds but it is the feeble will that has come in the way of literacy programs. A vast majority of those who are able to get to school don't learn anything other than cramming facts. Go to any village or even a moffussil, you will get to know for yourself how a degree of B.A. doesn't make any difference to a person. He still is as illiterate, as dumb minded, as superstitious and as blind follower as any illiterate is. The latent motive of politicians that why would they want to be questioned about issues when they can easily get a public that is smug in groveling and a second class citizenship in their own country stands well served by this current education policy. If Barack Obama were an Indian, he for all his oratorical skills and vigorous energy may have had to put in double the effort as he did in America to secure even a simple legislature win. Unfortunately neither he is son of a neta nor a rabble rouser or a local goonda. How many have exemplified taste of an election victory only on the grounds of unblemished character, charisma, good oratory, promise and impressive record. Perhaps the percentage of such politicians will not reach double figures. So in the wake of a dormant public and oversized and vastly diversified country it is not easy to be an Obama in India. When we try to find any Indian leader worth the potential of Mr. Barack Obama we forget leaders are never a personality in themselves only, they also reflect the followers. Leaders are the mirror image of the society they emerge from. If we converse the age old adage 'yatha raja tatha praja' (as is the king so are the subjects) to 'yatha praja tatha raja' (as are the subjects so is the king) this too stands equally true. If today America has a man like Barack Obama as President-elect it is because the American public rose itself above the tenuous but deeply entrenched despicable prejudices and selected the leader they thought would best represent them and their country. It is also because a young man virtually from nowhere, without much wealth or political backing was given the opportunity to show his true worth. It is also because the system did not demand Mr. Obama to be either corrupt or sycophant to come on top. It is also because even in the contentious contest either in primaries or in the presidential election no candidate broached the laid regulation set between them. And it is also because the great American dream is all about exploring the possibilities and potentials not about stifling and smothering them. And above all it is also because Americans symbolizes the ideals of unity much more profoundly than any other nation and in this election the victory of Mr. Barack Obama testifies to that. Can we forget how the famous actor of 1940s James Stewart left his successful career in Hollywood to serve in army when the call of his soul and national duty summoned him? Can we forget how John F Kennedy was chosen a president when it was most unlikely for a catholic to be elected as President? And can we forget the way Bill Clinton was forgiven by the American public after he confessed to having lied to the nation. To find a leader like Mr. Obama first we will have to become great citizens. We can't wait for politicians to do everything for us. Now that politicians have by and large failed Indian public it is the urgency of the time to stop expecting and start delivering on our own. Responsible citizenship, active interest in politics, becoming inquisitive and honest voting may be the best steps to start this revolution from. So let us raise our first step towards finding our own Indian Leader of Republic of India. He need not be only among those who run political family fiefdoms; he may come from anywhere including nowhere.